The headquarters of the brigade was located at the Gran Hotel,  Albacete, Castilla-La Mancha. They participated in the Battle of Madrid, Jarama, Guadalajara, Brunete, Belchite, Teruel, Aragon and the Ebro. Most of these ended in defeat. For the last year of its existence, the International Brigades were integrated into the Spanish Republican Army as part of the Spanish Foreign Legion. The organisation was dissolved on 23 September 1938 by Spanish Prime Minister, Juan Negrín, in an attempt to get more support from the liberal democracies on the Non-Intervention Committee. Albacete is a city and municipality in the Spanish autonomous community of Castilla–La Mancha, and capital of the province of Albacete. It is in the south-east of the Iberian Peninsula, in the region known as the Meseta Central within the historic region of La Mancha, in the smaller historic region of La Mancha de Montearagón; the area around the city is known as Los Llanos. With a population of 173,050 (2018) in the municipality proper, and 219,121 in the larger metropolitan area, it is the largest city in both the province and the region of Castilla–La Mancha, and indeed one of the largest of inland Spain, being included in the 20 largest urban areas in Spain. The municipality of Albacete is also the seventh largest in Spain by area, being 1,125.91 km2 (434.72 sq mi). The Battle of Jarama was an attempt by General Francisco Franco's Nationalists to dislodge the Republican lines along the river Jarama, just east of Madrid, during the Spanish Civil War. Elite Spanish Legionnaires and Moroccan Regulares from the Army of Africa forced back the Republican Army of the Centre, including the International Brigades, but after days of fierce fighting no breakthrough was achieved. Republican counterattacks along the captured ground likewise failed, resulting in heavy casualties to both sides. The Battle of Guadalajara saw the People's Republican Army defeat Italian and Nationalist forces attempting to encircle Madrid during the Spanish Civil War. The Nationalist forces involved in the Battle of Guadalajara were primarily the Italian Corps of Volunteer Troops. 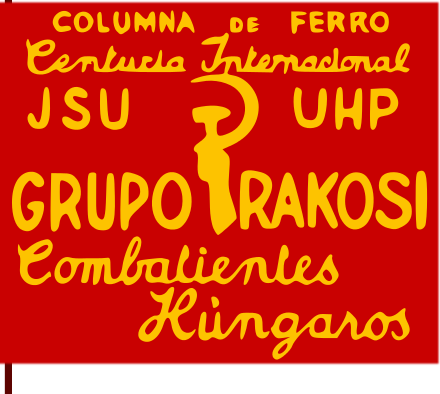 The International Brigades represented Comintern and Joseph Stalin's commitment to provide assistance to the Spanish Republican cause (with arms, logistics, military advisers and the NKVD), just as Fascist Italy, Corporatist Portugal and Nazi Germany were providing assistance to the opposing Nationalist insurgency. The largest number of volunteers came from France (where the French Communist Party had many members) and communist exiles from Italy and Germany. A large number of Jews from the English-speaking world and Eastern Europe also participated. Republican volunteers who were opposed to "Stalinism" did not join the Brigades but formed the separate Popular Front, the POUM, formed from Trotskyist, Bukharinist and other anti-Stalinist groups, which was composed of a mix of Spaniards and foreign volunteers (such as George Orwell)  or anarcho-syndicalist groups such as the Durruti Column, the IWA and the CNT. The Estado Novo, or the Second Republic, was the corporatist totalitarian regime installed in Portugal in 1933, which was considered clerical fascist. It evolved from the Ditadura Nacional formed after the coup d'état of 28 May 1926 against the democratic and unstable First Republic. 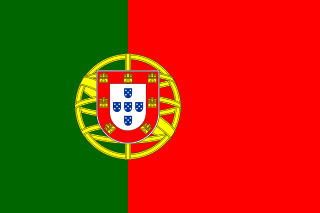 Together, the Ditadura Nacional and the Estado Novo are recognised as the Second Portuguese Republic. The Estado Novo, greatly inspired by conservative and authoritarian ideologies, was developed by António de Oliveira Salazar, President of the Council of Ministers of Portugal from 1932 to 1968, when he fell ill and was replaced by Marcelo Caetano. Using foreign Communist Parties to recruit volunteers for Spain was first proposed in the Soviet Union in September 1936—apparently at the suggestion of Maurice Thorez  —by Willi Münzenberg, chief of Comintern propaganda for Western Europe. As a security measure, non-Communist volunteers would first be interviewed by an NKVD agent. In political science, a communist party is a political party that seeks to realize the social and economic goals of Communism through revolution and state policy. The term communist party was popularized by the title of the Manifesto of the Communist Party (1848), by Karl Marx and Friedrich Engels. As a vanguard party, the communist party guides the political education and development of the working class (proletariat); as the ruling party, the communist party exercises power through the dictatorship of the proletariat. Lenin developed the role of the communist party as the revolutionary vanguard, when social democracy in Imperial Russia was divided into ideologically opposed factions, the Bolshevik faction and the Menshevik faction. 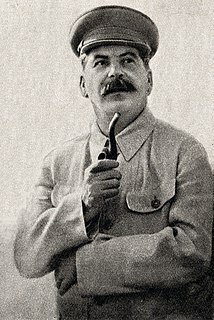 To be politically effective, Lenin proposed a small vanguard party managed with democratic centralism, which allowed centralized command of a disciplined cadre of professional revolutionaries; once policy was agreed upon, realizing political goals required every Bolshevik's total commitment to the agreed-upon policy. Wilhelm "Willi" Münzenberg was a German communist political activist. Münzenberg was the first head of the Young Communist International in 1919–20 and established the famine-relief and propaganda organization Workers International Relief in 1921. He was a leading propagandist for the Communist Party of Germany (KPD) during the Weimar Era, but later grew disenchanted with Communism due to Joseph Stalin's Great Purge of the 1930s. Condemned by Stalin to be purged and arrested for treason, Münzenberg left the KPD and in Paris became a leader of the German émigré anti-fascism and anti-Stalinist community until forced to flee the Nazi advance into France in 1940. Arrested and imprisoned by the Daladier government in France, he escaped prison camp only to be found dead a few months later in a forest near the commune of Saint-Marcellin, France. Luigi Longo, also known as Gallo, was an Italian communist politician and secretary of the Italian Communist Party from 1964 to 1972. Karol Wacław Świerczewski was an ethnic Pole serving as the Red Army general. He was a Bolshevik party member and Soviet officer in the wars fought abroad by the Soviet Union including the one against Polish as well as Ukrainian Republics and in Republican Spain. In 1939 he participated in the Soviet invasion of Poland yet again. At the end of World War II in Europe he was installed as one of leaders of the Soviet-sponsored Polish Provisional Government of National Unity. Soon later, Świerczewski died in a country-road ambush shot by the militants from OUN-UPA. He was an icon of communist propaganda for the following several decades. José Díaz Ramos was a Spanish trade unionist and communist politician. He was the General Secretary of the Communist Party of Spain during the Spanish Civil War. The operation was met with enthusiasm by communists, but by anarchists with skepticism, at best. [ citation needed ] At first, the anarchists, who controlled the borders with France, were told to refuse communist volunteers, but reluctantly allowed their passage after protests. [ citation needed ] A group of 500 volunteers (mainly French, with a few exiled Poles and Germans) arrived in Albacete on 14 October 1936. They were met by international volunteers who had already been fighting in Spain: Germans from the Thälmann Battalion, Italians from Centuria Gastone Sozzi and French from Commune de Paris Battalion. Among them was British poet John Cornford. Men were sorted according to their experience and origin, and dispatched to units. The French Communist Party provided uniforms for the Brigades. They were organized into mixed brigades, the basic military unit of the Republican People's Army. Discipline was extreme. For several weeks, the Brigades were locked in their base while their strict military training was under way. The Battle of Madrid was a major success for the Republic. It staved off the prospect of a rapid defeat at the hands of Francisco Franco's forces. The role of the International Brigades in this victory was generally recognised, but was exaggerated by Comintern propaganda, so that the outside world heard only of their victories, and not those of Spanish units. So successful was such propaganda that the British Ambassador, Sir Henry Chilton, declared that there were no Spaniards in the army which had defended Madrid. The International Brigade forces that fought in Madrid arrived after other successful Republican fighting. Of the 40,000 Republican troops in the city, the foreign troops numbered less than 3,000. Even though the International Brigades did not win the battle by themselves, nor significantly change the situation, they certainly did provide an example by their determined fighting, and improved the morale of the population by demonstrating the concern of other nations in the fight. Many of the older members of the International Brigades provided valuable combat experience, having fought during the First World War (Spain remained neutral in 1914–18) and the Irish War of Independence (Some had fought in the British Army while others had fought in the IRA). On 12 February, the British Battalion, XV International Brigade took the brunt of the attack, remaining under heavy fire for seven hours. The position became known as "Suicide Hill". At the end of the day, only 225 of the 600 members of the British battalion remained. One company was captured by ruse, when Nationalists advanced among their ranks singing The Internationale . There were heavy casualties on both sides, and although "both claimed victory ... both suffered defeats". It resulted in a stalemate, with both sides digging in, creating elaborate trench systems. Flag of Giustizia e Libertà , an Italian anti-fascist resistance movement led by Carlo Rosselli. Rosselli took part in the war, uniting a mix of Italian anti-fascist political forces, including socialists, anarchists, communists, and liberals together to support the Republican cause and took part in the fighting. Rosselli was assassinated by a French fascist in 1937. At dawn on 10 March, the Nationalists closed in, and by noon, the Garibaldi Battalion counterattacked. Some confusion arose from the fact that the sides were not aware of each other's movements, and that both sides spoke Italian; this resulted in scouts from both sides exchanging information without realising they were enemies. The Republican lines advanced and made contact with XI International Brigade. Nationalist tanks were shot at and infantry patrols came into action. 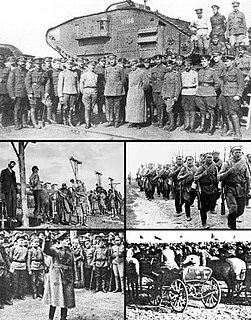 On 11 March, the Nationalist army broke the front of the Republican army. The Thälmann Battalion suffered heavy losses, but succeeded in holding the Trijueque – Torija road. The Garibaldi also held its positions. On 12 March, Republican planes and tanks attacked. The Thälmann Battalion attacked Trijuete in a bayonet charge and re-took the town, capturing numerous prisoners. In October 1938, at the height of the Battle of the Ebro, the Non-Intervention Committee ordered the withdrawal of the International Brigades which were fighting on the Republican side. The Republican government of Juan Negrín announced the decision in the League of Nations on 21 September 1938. The disbandment was part of an ill-advised effort to get the Nationalists' foreign backers to withdraw their troops and to persuade the Western democracies such as France and Britain to end their arms embargo on the Republic. United States 2,341  –2,800   See Abraham Lincoln brigade. Yugoslavia 1,500  –1,660  See Yugoslav volunteers in the Spanish Civil War. An exception is among groups to the left of the Communist Parties, for example anarchists. Among these groups the Brigades, or at least their leadership, are criticised for their alleged role in suppressing the Spanish Revolution. An example of a modern work which promotes this view is Ken Loach's film Land and Freedom . A well-known contemporary account of the Spanish Civil War which also takes this view is George Orwell's book Homage to Catalonia . In 1995 a monument to veterans of the war was built near Ontario's provincial parliament. On 12 February 2000, a bronze statue "The Spirit of the Republic" based on an original poster from the Spanish Republic, by sculptor Jack Harman, was placed on the grounds of the BC Legislature. And in 2001, the few remaining Canadian veterans of the Spanish Civil War dedicated a monument to Canadian members of the International Brigades in Ottawa's Green Island Park. On disbandment, 305 British volunteers left Spain. They arrived at Victoria Station on 7 December, to be met by a crowd of supporters including Clement Attlee, Stafford Cripps, Willie Gallacher, and Will Lawther. In the United States, the returned volunteers were labeled "premature anti-fascists" [ dubious – discuss ] by the FBI, denied promotion during service in the US military during World War II, and pursued by Congressional committees during the Red Scare of 1947-1957. However, threats of loss of citizenship were not carried out. The Mackenzie–Papineau Battalion or Mac-Paps were a battalion of Canadians who fought as part of the XV International Brigade on the Republican side in the Spanish Civil War. Except for France, no other country gave a greater proportion of its population as volunteers in Spain than Canada. The first Canadians in the conflict were dispatched mainly with the U.S. Abraham Lincoln Battalion and later the North American George Washington Battalion, with about forty Canadians serving in each group. The XV International Brigade was involved in the Battle of Jarama in which nine Canadians are known to have been killed. The Connolly Column is a phrase retroactively applied to a group of Irish republican socialist volunteers who fought for the Second Spanish Republic in the International Brigades during the Spanish Civil War. They were named after James Connolly, the executed leader of the Irish Citizen Army. They were a company-strength unit of the American Lincoln Battalion of the XV International Brigade, formed from Irishmen who were earlier part of the British Battalion of the same Brigade. The Durruti Column, with about 6,000 people, was the largest anarchist column formed during the Spanish Civil War. During the first months of the war, it became the most recognized and popular military organisation fighting against Franco, and it is a symbol of the Spanish anarchist movement and its struggle to create an egalitarian society with elements of individualism and collectivism. The column included people from all over the world. Philosopher Simone Weil fought alongside Buenaventura Durruti in the Durruti Column, and her memories and experiences from the war can be found in her book, Écrits historiques et politiques. The Durruti Column was militarised in 1937, becoming part of the 26th Division on 28 April. 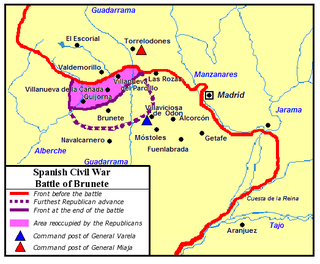 The Battle of Brunete, fought 24 kilometres (15 mi) west of Madrid, was a Republican attempt to alleviate the pressure exerted by the Nationalists on the capital and on the north during the Spanish Civil War. Although initially successful, the Republicans were forced to retreat from Brunete and suffered devastating casualties from the battle. The Second Battle of the Corunna Road was a battle of the Spanish Civil War that took place from 13 December 1936 to 15 January 1937, northwest of Madrid. In December 1936, the Nationalists launched an offensive in order to cut the Corunna Road and isolate Madrid, but a Republican counter-offensive stopped the Nationalist advance. The Nationalists cut the Corunna road but failed to encircle Madrid. The Siege of Madrid was a two and a half year siege of the Spanish capital city of Madrid, during the Spanish Civil War of 1936 to 1939. The city, besieged from October 1936, eventually fell to the Francoist armies on 28 March 1939. Madrid was held by various forces loyal to the Spanish Republic and was besieged and subject to aerial bombardment by the rebel faction under General Francisco Franco. The Battle of Madrid in November 1936 saw the most intense fighting in and around the city when the Nationalists made their most determined attempt to take the Republican capital. The British Battalion (1936–1938) was the 16th battalion of the XV International Brigade, one of the mixed brigades of the International Brigades, during the Spanish Civil War. The Thälmann Battalion was a battalion of the International Brigades in the Spanish Civil War. It was named after the imprisoned German communist leader Ernst Thälmann and included approximately 1,500 people, mainly Germans, Austrians, Swiss and Scandinavians. The battalion fought in the defence of Madrid. Amongst the commanders of the battalion were the German writer, historian and World War I officer Ludwig Renn and Prussian World War I officer Hans Kahle, later promoted to lead the Republican 45th division for a time. The battalion, like the International Brigades in general, also attracted its share of intellectuals, such as the well-known writer Willi Bredel who became its commissar. The Spanish Civil War had large numbers of non-Spanish citizens participating in combat and advisory positions. The governments of Germany, Italy—and to a lesser extent Portugal—contributed money, munitions, manpower and support to Nationalist forces led by Francisco Franco. The government of the Soviet Union, and to a lesser extent France and Mexico, likewise aided the Republicans (Loyalists) of the Second Spanish Republic. The aid came even after all the European powers had signed a Non-Intervention Agreement in 1936. While individual sympathy for the plight of the Spanish Republic was widespread in the liberal democracies, pacifism and the fear of another world war prevented them from selling or giving arms. The Nationalist pleas meanwhile were answered within days by Hitler and Mussolini. The Aragon Offensive it was an important military campaign during the Spanish Civil War, which began after the Battle of Teruel. The offensive, which ran from March 7, 1938, to April 19, 1938, smashed the Republican forces, overran Aragon, and conquered parts of Catalonia and the Levante. The International Brigades (IB) were volunteer military units of foreigners who fought on the side of the Second Spanish Republic during the Spanish Civil War. The number of combattant volunteers has been estimated at between 32,000–35,000, though with no more than about 20,000 active at any one time. A further 10,000 people probably participated in non-combattant roles and about 3,000–5,000 foreigners were members of CNT or POUM. They came from a claimed "53 nations" to fight against the Spanish Nationalist forces led by General Francisco Franco and assisted by German and Italian forces. The XII International Brigade was mustered on 7 November 1936 at Albacete, Spain. It was formerly named the Garibaldi Brigade, after the most famous and inspiring leader in the Italian Independence Wars, General Giuseppe Garibaldi. The XI International Brigade fought for the Spanish Second Republic in the Spanish Civil War. The Battle of Seseña was an ill-fated Republican-Soviet assault on the Nationalist stronghold of Seseña, near Toledo, 30 km south of Madrid in October 1936 during the Spanish Civil War. After the fall of Talavera de la Reina and Toledo in September 1936, the Nationalist troops pushed towards Madrid and in October they were 30 km from Madrid. Then the Republican government which had received new Soviet weapons decided to launch a counteroffensive in order to stop the Nationalist offensive at Seseña. The attack failed and the Nationalists resumed their advance towards Madrid. The battle is notable for being the first time that tank warfare was seen in the Spanish War and for the use by Nationalist troops of Molotov cocktails against Soviet T-26 tanks. Milicianas fought in the Spanish Civil War. They came from a culture with iconic fighters, and where women had been recently empowered through direct political engagement in political organizations and labor unions. The Dictatorship of Primo de Rivera saw women take more to the streets to protest and riot, though their actions were dismissed by male political leaders. The creation of the Second Spanish Republic led to an environment encouraging active political participation in broader Spanish society, and ultimately served to assist many women in their decision to head to the front, as the Government expanded rights for women, including the right to vote, divorce, go to school and stand for election. ↑ Thomas (2003), pp. 941–5; Beevor (2006), p. 157. ↑ País, Ediciones El (11 December 2011). "Reportaje | La última brigadista". EL PAÍS (in Spanish). Retrieved 27 April 2017. ↑ Sugarman, Martin. "Against Fascism – Jews who served in The International Brigade in the Spanish Civil War" (PDF). Jewish Virtual Library. p. 122. Retrieved 26 January 2012. ↑ "Third International | association of political parties". Encyclopedia Britannica. Retrieved 2018-10-07. ↑ "The Sinking of the "Ciudad de Barcelona", 30th May 1937". "Ciudad de Barcelona". Retrieved 20 March 2017. ↑ Orden, circular, creando un Comisariado general de Guerra con la misión que se indica (PDF). Año CCLXXV Tomo IV, Núm. 290. Gaceta de Madrid: diario oficial de la República. 16 October 1936. p. 355. ↑ Beevor (1982), p 137; Anderson (2003), p 59. ↑ McInerney, Michael (December 1979). "The Enigma of Frank Ryan part 1" (PDF). Old Limerick Journal. 1. Retrieved 25 June 2018. ↑ Michael W. Jackson (1995). Fallen Sparrows: The International Brigades in the Spanish Civil War. American Philosophical Society. p. 106. ↑ Lorenzo Peña, eroj@eroj.org. "Mensaje de de despedida a los voluntarios de las Brigadas Internacionales y otros discursos de La Pasionaria" . Retrieved 25 April 2015. ↑ Sachar, Howard M. (2013). Farewell Espana: The World of the Sephardim Remembered. Knopf Doubleday Publishing Group. p. 239. ISBN 978-0-8041-5053-8. ↑ Pugliese, Stanislao G. (1999). Carlo Rosselli: Socialist Heretic and Antifascist Exile. Harvard University Press. p. 209. ISBN 978-0-674-00053-7. 1 2 3 4 5 6 7 8 9 10 11 12 13 14 15 Lefebvre (2003), p. 16. Quoted by Beevor (2006), p. 468. 1 2 3 4 5 6 7 8 9 Quoted in Alvarez (1996). 1 2 3 4 Thomas (1961), pp. 634–639. ↑ "Los voluntarios cubanos en la GCE" . Retrieved 25 April 2015. ↑ "New book on Cubans in SCW" . Retrieved 25 April 2015. ↑ "Voluntarios Argentinos en la Brigada XV Abraham Lincoln" . Retrieved 25 April 2015. 1 2 3 4 5 6 7 8 Daniele Mariani (27 February 2008). "No pardon for Spanish civil war helpers". Swissinfo. ↑ "Lietuviai Ispanijos pilietiniame kare – Praeities paslaptys". www.praeitiespaslaptys.lt (in Lithuanian). Retrieved 2018-08-01. ↑ "frifagbevegelse.no - Nyheter fra arbeidslivet og fagbevegelsen". Archived from the original on 29 October 2013. Retrieved 25 April 2015. ↑ "Tusen dager" . Retrieved 25 April 2015. 1 2 efor. "The Greek antifascist volunteers in the Spanish Civil War". EAGAINST.com. Archived from the original on 10 October 2017. Retrieved 25 April 2015. ↑ "朱德等赠给国际纵队中国支队的锦旗". National Museum of China. 31 May 2012. ↑ "战斗在西班牙反法西斯前线的中国支队". Luobinghui. 30 March 2005. Archived from the original on 6 July 2008. ↑ "Spanish Civil War - Filipino Involement[sic]" . Retrieved 25 April 2015. ↑ "SPANISH FALANGE IN THE PHILIPPINES, 1936-1945". Archived from the original on 24 September 2015. Retrieved 25 April 2015. ↑ The Cult of the Spanish Civil War in East Germany (abstract) - Krammer, Arnold, Texas A&M University. Retrieved 14 May 2008. ↑ "Canadians in the Spanish Civil War" (PDF). ↑ Kastner, Susan (4 June 1995). "Unsung Canadian soldiers honored . . .at last". Toronto Star . Archived from the original on 7 November 2012. ↑ ""Mac-Pap" Monument Unveiling". workingTV. Archived from the original on 27 December 2016. Retrieved 25 April 2015. ↑ Report of the Judicial Committee of the National Council, Off. J. 2002 pp. 7786 et seq. ↑ "Parliament pardons Spanish Civil War fighters". Swissinfo . Retrieved 13 March 2009. ↑ Baxell, Richard (6 September 2012). Unlikely Warriors: The British in the Spanish Civil War and the Struggle Against Fascism (Hardcover). London: Aurum Press Limited. p. 400. ISBN 1845136977. ↑ Premature antifascists and the Post-war world, Abraham Lincoln Brigade Archives — Bill Susman Lecture Series. King Juan Carlos I of Spain Center at New York University, 1998. Retrieved 9 August 2009. ↑ Bernard Knox, Premature Anti-Fascist, reprinted from The Abraham Lincoln Brigade Archives — Bill Susman Lecture Series. King Juan Carlos I of Spain Center — New York University, 1998. Retrieved 9 August 2009. ↑ The New York Times Biographical Service. University Microfilms. July 1985. ↑ Patricia Burgess; Roland Turner (1988). The Annual Obituary. St. Martin's. Alvarez, Santiago. (in Spanish)Historia politica y militar de las brigadas internacionales Madrid: Compañía Literaria, 1996. Castells, Andreu. (in Spanish)Las brigadas internacionales en la guerra de España. Barcelona: Editorial Ariel, 1974. Kuuli, O; Riis, V; Utt, O; (editors) (1965) (in Estonian)Hispaania tules. Mälestusi ja dokumente fašismivastasest võitlusest Hispaanias 1936.-1939. aastal. Tallinn: Eesti raamat. Coale, Robert S. (2016). "From Antifascistas to PAF: Lexical and Political Interpretations of American International Brigaders in Spain during the Second World War". In García, Hugo. Rethinking Antifascism: History, Memory and Politics, 1922 to the Present. New York: Berghahn Books. pp. 187–201. ISBN 978-1-78533-139-8. Wikimedia Commons has media related to International Brigades . XII International Brigade – "Garibaldi"